Shortly after I started breeding draft ponies, another breeder told me she didn’t see any reason to imprint foals because these types of ponies are inherently people-oriented. Someone else told me that they had purchased a young pony that had been imprinted, and it was much too forward and in their face for their tastes. That pony was eventually sold. I was acquainted with Dr. Robert Miller’s work with imprinting and had read numerous articles about the importance of early work with foals, so these stories surprised me. Despite these contraindications regarding imprinting, I still proceeded to study Dr. Miller’s techniques diligently and put them into practice as my foals were born. After several years, though, I found that I gravitated to Rowan’s approach, letting the mare and foal bond and then working with the foal later. I no longer rigorously follow Dr. Miller’s imprinting techniques during the first two hours. Instead, I rely on the strength of my relationship with my mares to teach the foals that I am a welcome member of their world. And I suspect that there is indeed something to what that breeder told me many years ago about these draft ponies: they seem to be genuinely people-oriented. 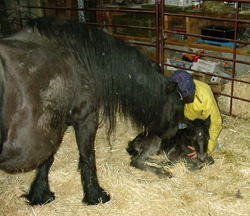 The goal of imprinting – a specific training technique for the first two hours of life – is to help the foal understand that humans are not to be feared. Note that some mares may need to be restreained for safety. I’m also mindful of that pony that was imprinted and was considered too ‘in your face.’ The article stated, “Keeping a horse from becoming ‘too human’ is a matter of balance. As you spend time with your foal, make sure he also spends time as a horse with his dam and herd members.” I have found, however, that it’s more than making sure the foal spends time with its herdmates. I think we humans have a responsibility, too, to teach the foal boundaries so that it understands that it shouldn’t crowd, barge, push, or bite us like it would another of its own species. I have found that all my ponies, regardless of age, wherever they were reared, need this sort of work. Backing up: I think it’s especially difficult for women breeders to encourage a foal to go away because we’re intrigued and complimented by a foal’s interest in us. I admit that at the end of a long, cold day when snow is falling sideways, having a foal walk to the fence to greet me when he sees me warms my heart. But having them move away when asked is important, too, whether in response to a touch or a hand movement or the flick of a rope simulating a tail. I’ve been told that a pony can’t rear if they’re backing away, and that they’re less likely to bite if they’re asked to back up regularly when they get aggressive. To start, I teach foals to back up in response to a touch on their chest or nose. It’s very important to remove the touch once they try to back up, as they learn from the release, not from the pressure. When I put a halter on, I then reinforce backing by pulling down and slightly back on the halter, releasing when there’s the slightest shift of weight. When a foal is particularly high energy and I see him coming from some distance away, I will ask him to stop his forward motion or back up by raising my hands and pushing at him rhythmically in the air, again relaxing as soon as he shows some response. If he doesn’t respond to this approach, I will often take an energetic step or two towards him. So far, that has been enough to send my foals the other direction. If a foal shows any signs of fear at my techniques, I will then approach him gently and regain his trust. I rarely have to do this now; my foals are more likely to come to me to play some more! Voice: Perhaps it’s my experience working ponies in harness, but using voice commands is something I do without thinking. My foals learn the meaning of ‘No’ early, and all of my ponies know their names and recognize the difference between when I say their name with affection or with sternness. Blocking: Foals are naturally curious, and often they see us human caregivers more than other ponies if we isolate mare and foal in a foaling stall. If not taught otherwise and especially if we have a good relationship with the mare, foals assume that we are a pony and can be treated as such. We need to keep in mind that a foal’s actions are not wrong so much as misguided, and as caregiver, it’s our responsibility to guide them in a positive manner. Hitting or slapping at inappropriate behavior can easily be misconstrued by the foal. Instead, we need to block the behavior and then redirect it. Blocking involves physical motion that establishes a boundary in the air that the foal shouldn’t cross but that they have a choice about. For instance, if a foal comes up to me and nibbles on my coat, my response is to run my hand energetically up and down in front of my body, blocking his access to my coat. If he chooses to cross the boundary, he gets hit by my moving hand, but I’m not directing the impact at him. I use blocking actions constantly with all my ponies. Redirecting behavior: Foals like to be scratched in their favorite places. Typical favorite places are the front of the shoulder, between the front legs, on the withers and on the rump. My foals naturally want to reciprocate when they’re getting a good scratch. I always enjoy watching my ponies when they’re engaged in mutual, simultaneous grooming; they seem to be fully enjoying each other’s company. A foal, though, needs to have its desire to reciprocate redirected, as we don’t want to encourage nibbling or biting people. Within the first few days of a foal’s life, I start this training, by scratching a favorite place with one hand and positioning the other hand to tap the mouth away when the foal starts to reciprocate, similar The goal of imprinting - a specific training technique for the first two hours of life - is to help the foal understand that humans are not to be feared. Note that some mares may need to be restrained for safety to blocking above. By continuing to scratch while also providing discipline, the foal learns that while humans are capable of providing good scratches, they are not a pony that should be chewed on in return. I have learned the hard way that some mares are better disciplinarians than others. One of my mares lets her foals climb all over her, chew on her mane and forelock, and walk into her feed bucket. She has been a stellar broodmare for me, but this indulgent behavior means I have more work to do in teaching her foals about boundaries. With this mare’s fifth foal, it was much easier since I knew the work I needed to do, and I knew the foal would still like me even if I had to discipline. In contrast, I have another mare who will go so far as to kick her foals away when she has a feed bucket. These foals are much more respectful of me when I begin to work with them. Last year I had the opportunity to speak with the owner of a horse rescue. Her work was focused on draft horses bound for slaughter. She told me that many of the horses she rescues have to be taught good manners about their feet. Some are head shy or difficult to halter or bridle. And some are fearful and distrustful of people. Somewhere along the way, these horses weren’t taught the basics of domesticity. The fortunate ones end up at a rescue that can perform the training and socialization that could have been done at a much earlier age. When we choose to breed horses, I think it’s our responsibility as breeders to ensure that the horses we produce are taught the basics of domesticity so that they have the best chance for a happy, productive life. While some people may have the facilities and resources to not handle foals until weaning, my management situation and my personality require that I be involved with the foals from the instant they are born. While imprinting isn’t strictly necessary in my situation, it may still be a good choice for other people and their foals. Recognizing that foals provide us with two valuable training periods during their first week of life is a key component of successful early foal training. Recognizing that those two periods have different goals, we can plan our training accordingly. Then, recognizing that horses that are too ‘in your face’ may have as much trouble staying in good homes as those not taught the basics of domesticity, I have found boundary setting to be crucial. All of this early work with foals can help us give the equines we produce the best chance for long and rewarding lives. 1 Emrys, Rowan. HorseSense: A Practical & Natural Horse Management Handbook Featuring Dynamite Specialty Products. Tarryall Farm, Fort Collins, Colorado, p. 27. 2 Parelli, Pat. “A Good Start: With Foals, Timing is Everything,” Savvy Times, Issue 31, May 2011, Parelli Natural Horsemanship, Pagosa Springs, Colorado, p. 60-61.
issue of Rural Heritage magazine.